It's all in the game!! 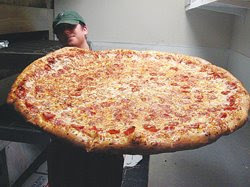 : Man vs Food. The two kinds of people in the world... the ones who work really very hard to even have 1 square meal a day, and the ones who work extremely hard to reduce that extra 5kgs of body fat. Both of them sweat, sizzle everyday and are not happy with their current state. This post is for the latter type! While American restaurants have often been called out for their sometimes gluttonous serving sizes, some are proud of their over sized portions. 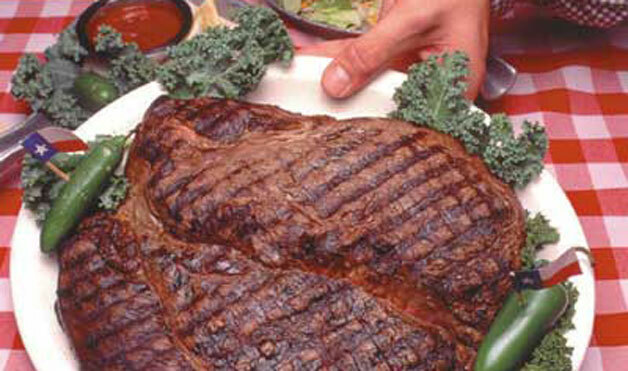 so proud, in fact, that a few food purveyors have made them into official eating challenges. Thats this TV series is all about. Sometimes it makes you wonder why the Americans have this much of luxury, while the rest of the world does not! 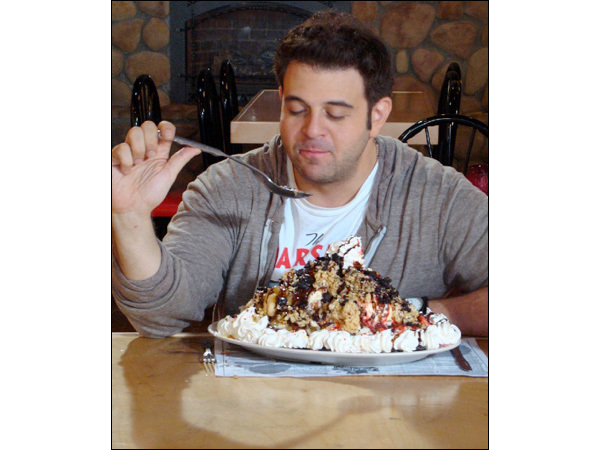 The host Adam Richman, a witty and cheerful guy, goes from place to place all over America in search for exotic food challenges, attempts to win them. Makes you wonder "what a life this guy has got". All he has to do is to go around and eat awesome stuff and somebody pays him to do that...! 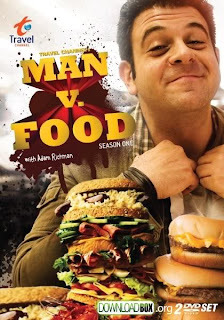 Every episode, The host Richman, explores the major food points of the particular city before attempting the main challenge. That means more visual treats for the viewer. Here 'challenge' means either finishing huge quantities or handling extremely spicy stuff! Being Indians, the spicy hot food stuff may not look really challenging, but the ridiculously huge quantities involved in some of the other challenges do make your head rotate! The one episode where he attempts and successfully finishes a 72oz steak, which looks like a pillow, in 1 hour (which a cheetah would normally finish in 2 days), makes you think if this guy is from mars or some other planet far far away! On the other hand this show acts as an excellent platform for promoting the restaurants. Probably the restaurant owner sponsors the particular episode, inviting the crew to their city/state. For all we know, they may even create a new challenge just to feature in the show (although it's claimed that the challenges are traditional etc). 72oz steak, 6 pound sandwich, 8 pound ice cream (8 scoops of different flavors with all possible toppings), mammoth burger weighing 10 pounds, fiery hot chicken wings, 42 inch pizza etc are some of the challenges. Before eating these things, Adam goes into the kitchen and takes us through the making of each recipe. It's like take a of bun, put a 2 pound patty in it, load it with 4 slices of cheese, add 5 strips of bacon, add another 2 slices of cheese, eat the burger and finally call the cardiologist!!! Any TV series producer reading this blog, if you are planning to make an Indian version of Man vs Food, please consider me for hosting the show. I look good, I am funny and I have a raging appetite for food. I promise I'll be as good as Adam Richman, if not better!!! getting a paid job where you eat all day... Sounds too good!